Google already sells apps, games, movies, and magazines in India through its Google Play Store. However, the company still hasn’t started selling music and TV Shows in the country. Now, it looks like the search giant might launch its music services in India soon. The company recently unveiled YouTube Red, which is an unlimited music and video streaming service, but it is not available in India. 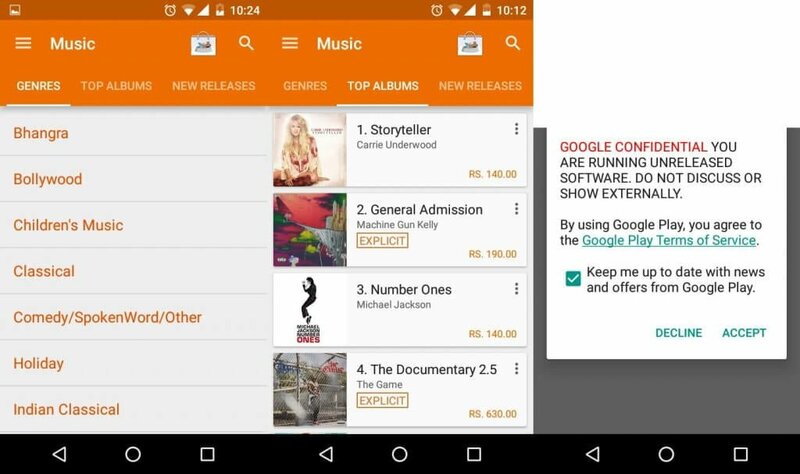 A redditor from India has posted screenshots on the Internet, claiming that Google is testing the Play Music service in India, and that it might launch soon in the country. The redditor accidentally got access to an internal unreleased build of the Play Store, and after he installed it, he could use the Google Play Music service. As you can see in the screenshots, the Google Play Music app has listings of Indian music genre such as Bhangre, Bollywood, and Indian Classic. The music albums in the Google Play Music services are priced anywhere between Rs. 140 to Rs. 630. Currently, Apple is selling digital music in India through its iTunes service, and the company has also launched its unlimited music streaming service Apple Music, which costs Rs. 120 per month for a single account and Rs. 190 per month for a family plan. Even if Google launches the Play Music service in India, we are not sure whether its music streaming service Play Music All Access would be available to users in the country. Some of the music streaming services, which are popular in India are Saavn, Gaana, Rdio, Airtel Wynk, and Guvera.